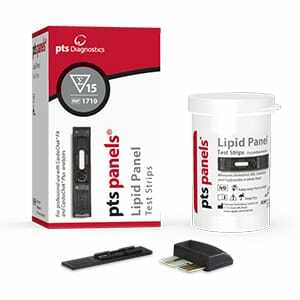 Metabolic Chemistry Panel for CardioChek Plus and CardioChek PA (box of 15). 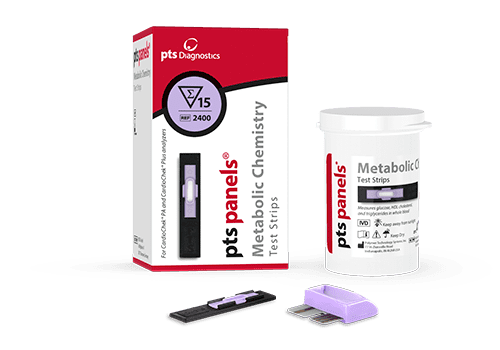 The PTS Diagnostics Metabolic Panel Test Strip measures high density lipoprotein, Triglycerides (TRIG) and glucose (GLU). Total cholesterol values give an indication of the overall amount of cholesterol circulating in the blood at the time the test is given. Approximately 85% of the cholesterol in our blood is produced by our own bodies with the remaining 15% coming from animal products found in our diet. Moderate amounts of cholesterol are essential for production, maintenance, and fluidity of cell membranes; nerve insulation and conduction; as well as hormone and bile salt production. However, a high cholesterol level (over 200 mg/dL) can be detrimental our health, leading to increased fat deposits and build up in blood vessel walls, clogged arteries (known as atherosclerosis), and significantly increasing the potential for heart attack or stroke. Approximately 85% of the cholesterol in our blood is produced by our own bodies with the remaining 15% coming from animal products found in our diet. Moderate amounts of cholesterol (a type of lipid) are essential for production, maintenance, and fluidity of cell membranes; nerve insulation and conduction; as well as hormone and bile salt production. 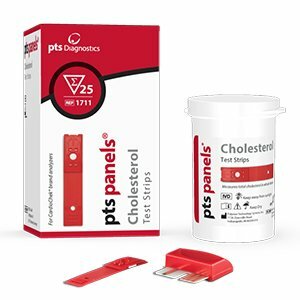 The total cholesterol reading is an indication of the overall amount of cholesterol circulating in the blood at the time the test is given. High-density lipoprotein is beneficial to heart health due to its ability to transport cholesterol and triglycerides within the water-based bloodstream to the liver for removal or re-utilization. Blood glucose is a simple sugar that comes from the breakdown of carbohydrates. It is the primary source of energy used by the body. As we digest carbohydrates, glucose enters the blood, raising blood sugar levels and stimulating the pancreas to release insulin which helps the cells absorb glucose for energy or storage. 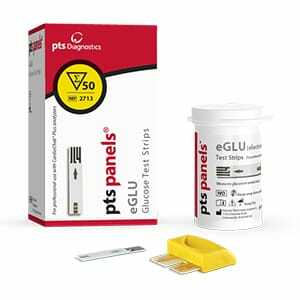 If blood glucose levels rise too rapidly or too often, the cells become ineffective in their response to insulin leading to metabolic syndrome and eventually diabetes. 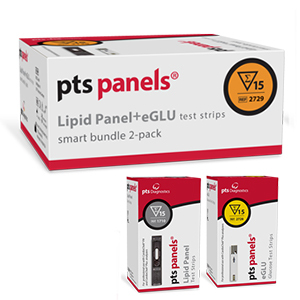 It is important to test blood glucose periodically to assess your body’s ability to process it effectively.